The Kona Coast on the Big Island of Hawaii is known as the "Land of the Giants", and with good reason: thousand pound monsters are caught within 1/4 mile from shore. It's a relatively new island in geological terms, and the ultra-steep drop-offs on the water's edge make for some of the world's most fertile hunting grounds. 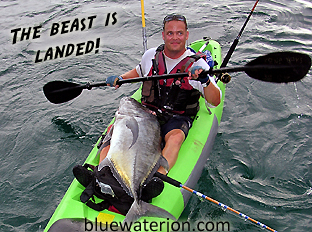 That's why I was there - to pit myself, on a kayak, against the biggest fish I could possibly battle anywhere. Having been there before, I had some idea of the types of fish I might find myself up against, and what special gear and techniques I would need to use if I had any chance of besting these beasts. Two speed reels, super short custom rods, spears, and state of the art shark repellant equipment were the tools I would use, and as you will see, each of these tools proved to be vital to my success, and indeed, to my survival…. Two local kayakers had warned me that I needed to have some sort of protection against the tiger sharks that can reach 2000 pounds. Unlike great whites of similar size, these behemoths inhabit shallow coastal waters, and can be seen fairly regularly from shore. One kayaker carried a bang stick just in case he was attacked, and another spoke of a device that deterred sharks by emitting electrical pulses that the sharks detected in the jelly-filled sacs in their snouts called Ampullae de Lorenzini. Neither of these sounded like something I wanted to depend on in a critical situation. The fact was that I was already there, and since I didn’t have either device, it was either stay on shore, or fish. I reasoned that if so many people kayak, surf, dive, and swim without being eaten and mauled on a regular basis, I was being overly cautious. There was one big difference between what I would be doing and these sports, though- I’d be using large baits that trailed blood, gaffed fish bled, and if I hooked into a fish, that would act as a lure to predators father up the food chain. Well, I had some time to mull it over anyway. For part of my trip, I had hired a boat and a film crew to get some footage of me fishing. 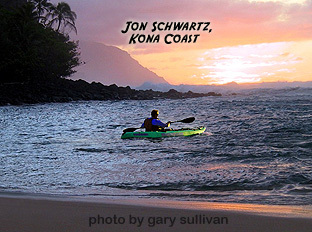 We'd be working on a film that I later released in 2007 called Bluewater Jon and the Giant Tuna that documented my wild quests to battle monsters in this exotic land (trailers and DVD available at www.bluewaterjon.com) While I thought about what to do regarding the sharks, I prepped my kayak and gear. I had brought over a cooler full of 15 inch sushi quality mackerel that I had prepped in a brine solution to lengthen its shelf life, and my cooler needed some more ice, so I went to the nearest gas station to get some. As I was paying the cashier, I looked down and noticed, to my horror, a front page headline that read: "Local Officials Fear Sharks Being Lured", and the article went on to describe how, at this very moment, there were tiger sharks being spotted on a regular basis at the very spot that I planned to launch out of! The next day, as the boat took me and my kayak through these same waters, I looked down, trying to catch a glimpse of one. No dice. And no dice was to be the theme of the day! They crew took me all over the place, dropping me off in several choice locations to paddle around with baited rods, but no real action occurred. Excitement slowly gave way to hopelessness and despair, and at 3:00, the boat's captain muttered the inevitable to me over the marine radio: "Sorry, Jon, I have to get the boat back to the docks. Let's get you and your kayak in the boat and head home...."
"Captain Gabe, what's the chance you could let me off here and let me paddle back by myself?" "Uh, I guess we could do that.."
"Well then stop the boat!" And so began the first real journey of my trip. 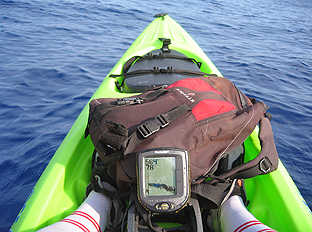 I got into my kayak, taking my portable fish finder and small tackle box with me, and began paddling around. I figured there must be something wrong with my depth finder because I wasn’t even getting a reading. It wasn’t until I got within a three hundred yards of shore that I started registering some numbers… 598… 590…595…big numbers for being so close to land! This intimidated me so I paddled closer, in the hopes of coming into some more “modest” depth numbers, but even at 50 yards from shore, my fish finder was registering an incredible 300 feet deep! I got out a special knife jig that can reach the bottom quickly. Using this, I caught a small fish, called a Wahanui. 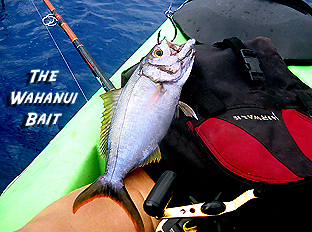 I had planned on using artificial baits so as to not attract sharks, but this fish was just too good of a baitfish to pass up, so I took out some special knottable wire, quickly fashioned a leader with a circle hook, put 8 ounces of lead above the swivel, and dropped Mr. Wahanui down to see what would happen. As I began drifting, I noticed that the amount of boat traffic had increased considerably. It occurred to me then that the boats returning now were probably the first out of many boats that would be coming in within the next 20 minutes to beat the 4:00 deadline for the Firecracker Marlin Tournament that had been advertised all over the island. All of a sudden, I hear the line race off the reel, making a high pitched whine that shocked me with its ferocity. I slowly increased the drag on my TLD-20 rigged with Spectra, and soon the line was taught. My all roller 60-100 pound Seeker Rod was completely bent over the side of the kayak and into the water and I was struggling to keep from getting pulled over. Whatever this fish was, I had never fought anything like it. Its brute strength was incredible, and I shuddered to think at what I was now attached to. It felt like I was riding a bull. I fumbled with the lever drag, trying to find the right amount of pressure that stopped the fish from going any deeper, but still allowed the fish to gain some line in its brutish bursts. At this point, I heard a low, distant rumble, and as I looked toward the horizon, I saw a fleet of boats seemingly as big as the ones in those old WWII films heading directly for me! The fish was towing me directly into the path of the returning boats which were all coming in at the same time to beat the tournament buzzer! Next, I hear a helicopter overhead, and I start thinking, Man, am I in trouble? Have they come to arrest me? Maybe I shouldn't be fishing here! As I am struggling to maintain balance on the kayak, the first boat comes straight towards me and almost capsizes me with the wake. Mind you, I am in no position to maneuver- I'm hanging on for dear life. In the midst of all this chaos, it occurred to me that the brute at the end of my line might be one of the tiger sharks that had prompted the warning in the newspapers! Perhaps there will come a time in all of our kayak fishing days that we will be confronted by the question: Should I cut the line? Is it worth it? I flashed quickly on how I might live forever with regret at having never had the chance to see just what this fish was, and decided to brace myself for the arriving flotilla as well as the possibility that this monster might surface at any moment. If you've ever been to the Big Island you know that the boats don't stop trolling until they get in the harbor, because everyone knows there is a chance they will hook a huge marlin right at the harbor's entrance, so you can be sure they weren't going to stop for me on the way in! They plowed past me with looks of anger and disbelief; the fact was that most of them weren't flying any flags, indicating that they caught nothing, and here was this clown in a plastic kayak right next to shore on a huge fish! Then, a flash of light, and a giant white belly... what could it be? It was something I'd never seen before- a shark? All of a sudden it was obvious- an ulua, or giant trevally, and a huge one at that! Uluas are one of the most formidable foes in the ocean, and I couldn't believe that my first exotic Hawaiian game fish was now right beside me! With a huge sense of relief I quickly pulled him onto my lap and began the paddle back to the harbor. As I neared the end of the harbor where the boats weigh their catch and fuel up, I again noticed something odd- few boats had any flags raised, and there were even fewer fish being weighed, which meant, as I had noticed before, that it had been a slow day of fishing for the tournament. Mind you, Kona is the crème de la crème of big game fishing, and this particular area where the boats return is ground zero for boats to cruise in with their catch, anglers chests' puffed out- but it wasn't happening today. Therefore the sight of little old me in my green plastic rental kayak paddling in with a big fat fish laying across my lap must have really raised a few eyebrows! I paddled into an empty slip at the weigh station and the crowd that stood in waiting for the tournament results grew quiet with my approach. Since nobody was weighing any fish, a host of surprised volunteers offered to help me with my catch, easing it off my lap and onto the scales. 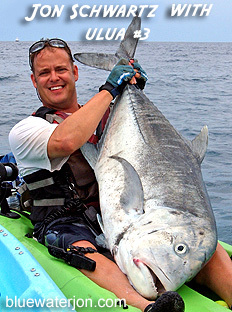 The big ulua turned out to be 55 pounds on the certified scale, and I could hardly believe it! But the story doesn't end just yet.... The next day was a carbon copy of this day; I had no luck when the mother ship was watching me fish, but again they dropped me off on the way back, and again I caught another ulua- this time 40 pounds. Talk about irony! Same thing too at the hotel- I called the cameraman up to watch me unload the fish from my car, and donated the fish to a staff member. I figured that this stretch of luck had run its course, and I was fine with that. I cancelled my mother ship trip the next day, and decided to launch out into the same area with a fellow kayaking friend on paddle power alone. At this point I was content to just paddle and enjoy the sights- if I didn't hook up, I was still overpaid. We got out of the harbor and began trolling, when all of a sudden my pal's rod goes bendo, and he's on to something nice. By the time I paddle over to him, he's got a nice 15 pound tuna doing a dance around his kayak, and he decides to skewer it with his spear. In fact, this fellow uses this same spear instead of a gaff for all of his fish, since it handily doubles as a shark deterrent. It was effective, but left a substantial blood trail, and remembering the shark warnings that had been posted for this exact area, I asked him, "Uh, Steve- what do we do if a tiger shark shows up?" "Oh, don't worry, Jon- we'll just stick together and let him know that we're not bait. Worse comes to worse I have my spear and you can smack him over the head with your paddle...."
Needless to say this was not exactly what I wanted to hear! Sure enough, on the way back, Steve's bait gets hit again, but it's a much bigger fish this time; he's getting towed around in every direction like the outro to the Benny Hill show. I can't keep pace with him so I yell into the VHF, "What are you on, man" and he responds "I have no idea, but whatever it is, it's HUGE!" Ten minutes rolls by and the fish starts to tire. He was even farther away now, and he yells into the VHF "OK Jon, I got color, I got color.... It's a ..." and then there was about 15 seconds of breathtaking silence, punctuated by him screaming "TIGER SHARK!!!!!" with such force into the radio that the speaker almost blew up! The first thing that came to mind was, I made a pact to back this guy up in case something strange happened, and now something, uh, strange has happened. The thought occurred to me that in fact I have a wife and three kids, and he only has a wife, so maybe it would be ok if I just wait a bit and see if the coast is clear before I paddle over there...but my sense of obligation took over and I began to paddle towards him. Much to my relief, before I get to him he announces "It's ok, it's over- I cut the line", and just when I get within speaking distance of him, one of my reels starts to scream! I had totally forgotten that I was even trailing any baits! Now it's my turn to go for a sleigh ride, and his turn to try and catch up with me. My fish makes a beeline for the rocks at the jetty, and I decide to see if I can't turn his head before he will breaks me off on my 30 pound line. Fortunately, my trick works- he changes directions, heading out towards the open ocean, where I have a much better chance at tiring him out. And guess what surfaces 20 minutes later? Another ulua, except this one is way bigger than the ones from the two days' before! He was exhausted, and I planned to revive and release him, but my friend wisely advised me not to. 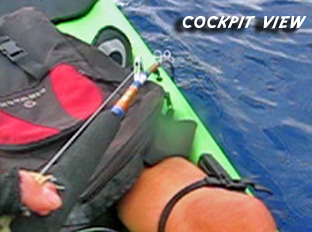 After all, reviving him as he quivers in my hands not 5 inches from my kayak would surely tempt the sharks that had proven to be there, so we decided to take him in again to the scales. This one came out to be the biggest of all- 64.5 pounds! This really was beginning to seem like a fairy tale and I remember looking at my hands a lot- I had been told that that is one way to check if you are awake or just dreaming. 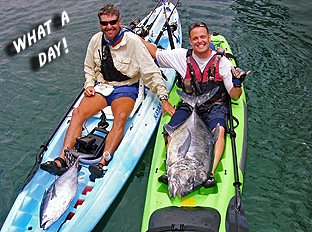 Suffice it to say that you should have seen the looks on the faces of the people at the weigh station this time- same silly guy on a kayak with three uluas in three consecutive days! And the look on the faces of my friends at the hotel was even crazier! Once again, I had brought back a monster ulua, and once again, I donated the fish to a worker at the hotel for a family feast.